It's crunch time over here which means I have a to-do list longer than my arm and I'm literally bleeding screenprinting ink. 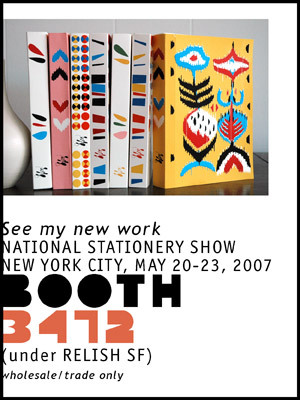 I've been totally loopy getting everything ready for the upcoming National Stationery Show in New York. The last time I went to the show I was a buyer (when I owned my wedding business), so it'll be interesting to experience the show from the "other side of the booth" this time around. Not to mention, this will be my first time exhibiting at a trade show EVER. The above image is a little taste of my new line of products--these are limited edition, hand screen-printed journals. My line will be represented by Relish SF. I'll be sharing the booth with several other businesses run by wonderfully talented girls/friends: Jill Bliss Allymoon, K. Autumn (who is also the owner of Relish), Good on Paper, and Nantaka Joy. I can't wait to meet Joy whom I've only gotten to know through emails and phone calls. I'm sure her debut collection is going to be stunning! If you're attending the show, do stop by BOOTH 3472 and say hello--we're super nice and we gots matching aprons we'd like to show off! 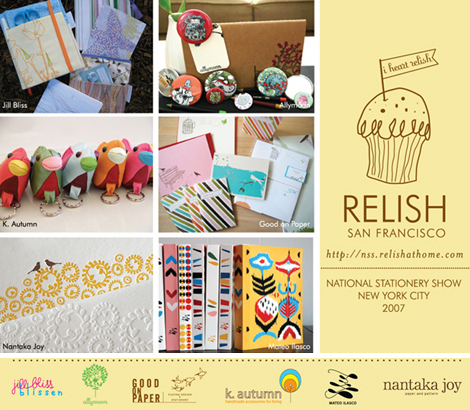 To request more info, visit the official Relish SF website.